Finolhu Maldives is a newly opened resort in 2016, it has a unique concept where all the decorations and furnitures around the resort is a combination of modern contemporary with a touch of the vintage/80s look and feel. Quoting from how they would describe their resort as "A vibrant new era of classic travel. We have looked to the past to uncover the future of travel." Also located in the UNESCO protected Baa Atoll, Finolhu Maldives just 30 minutes away by speedboat from their sister property - Amilla Fushi. 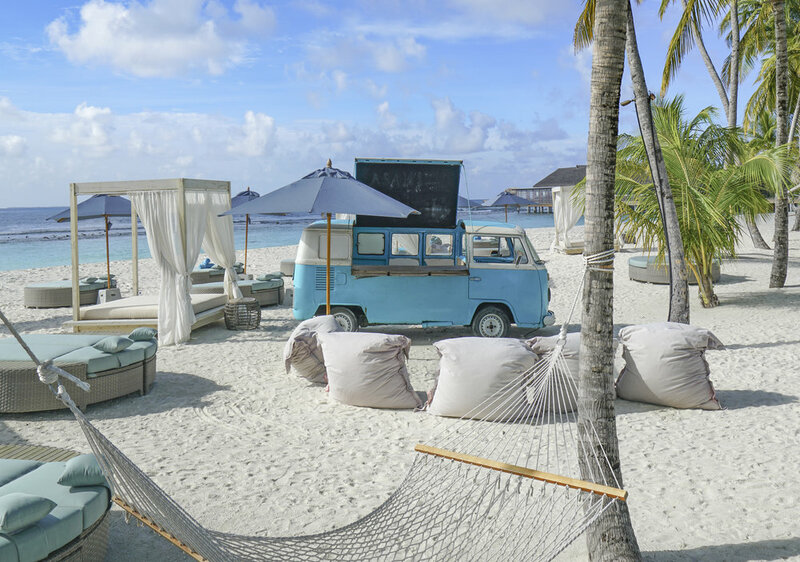 Unlike most resorts in the Maldives that focuses on the the honeymoon concept, Finolhu is a fun, retro-inspired island that encourages larger group of friends and families to gather and party. One major highlight, also my personal favorite about this island resort is the 1.5km long sand strip along the island. It is probably the longest sand strip I have encountered in the Maldives or anywhere else. 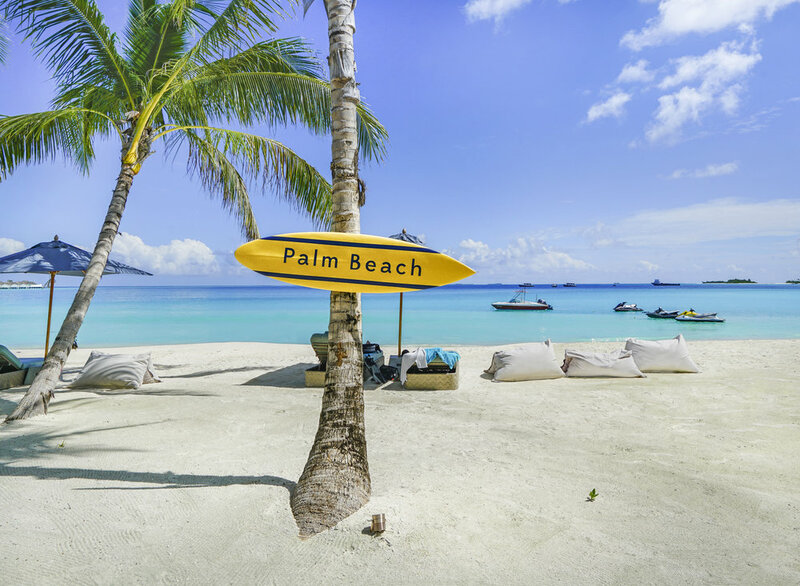 To me, its absolutely stunning, it might seem rather long to be walking down under the sun, but for those who enjoy strolling down the beach with soft powdery sand, this is the perfect place to be. 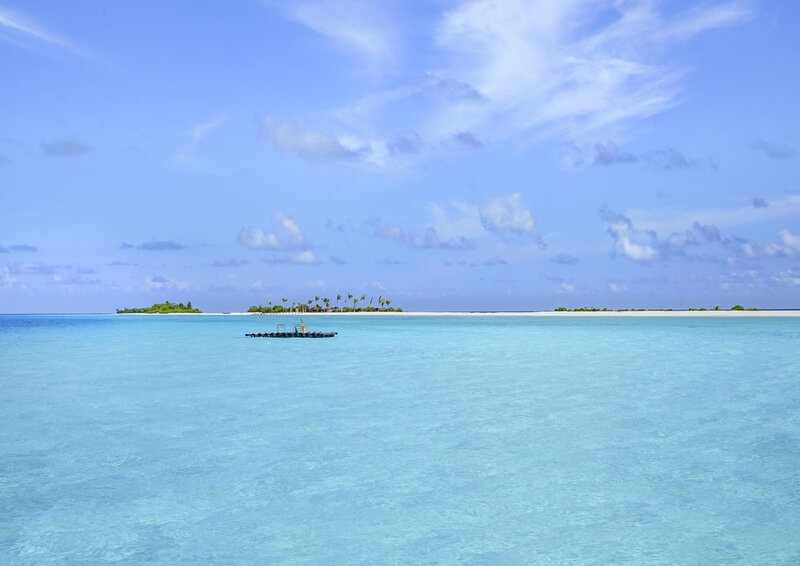 There are two main types of accommodations here at Finolhu, over water villas and beach houses. 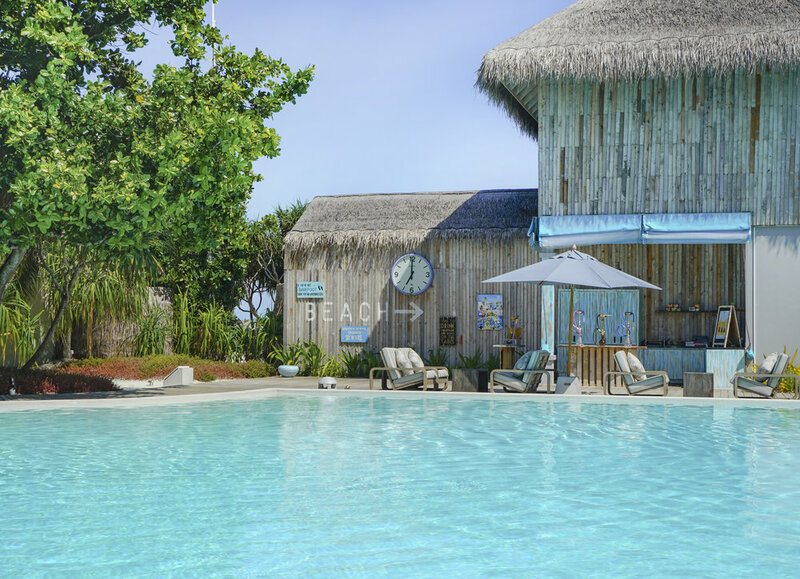 As seen on the image below, there are two sides of the over water villas, one side is facing into the lagoon (on the right) and at sunrise without a private pool, and the other side is facing the edge of the house reef, also the view of sunset and has a private plunge pool on the sundeck. There are also 7 two bedrooms overwater villas to choose from, all of them have a larger private pool and a living space, perfect for family and friends. 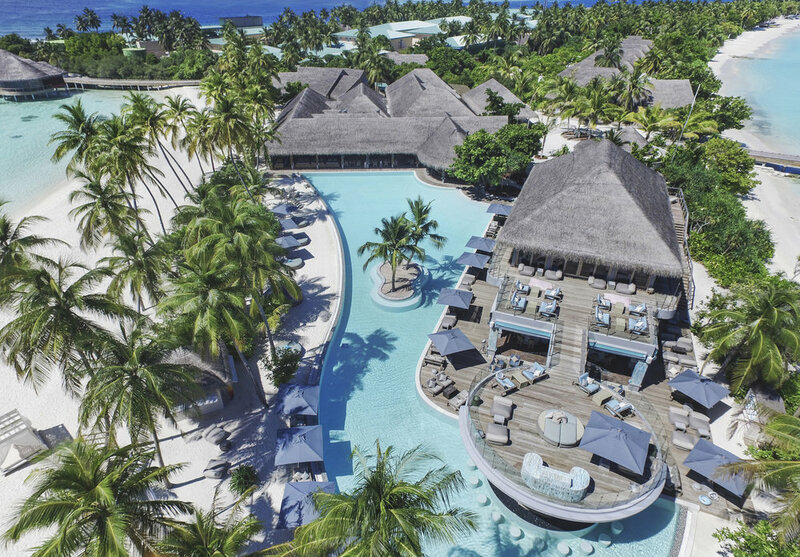 Besides the usual gym and spa facilities at most resorts around the Maldives, there is also a Tennis court on this island, guests from both Amilla Fushi and Finolhu can both enjoy a nice match. For guests at Amilla Fushi, you'll have to travel by a 30 minutes speedboat to get here, but it is definitely worth to check out another paradise island when you're visiting Maldives. The Spa at Finolhu is called The Cove Club, each of the treatment rooms celebrates an iconic beauty of the 60s. 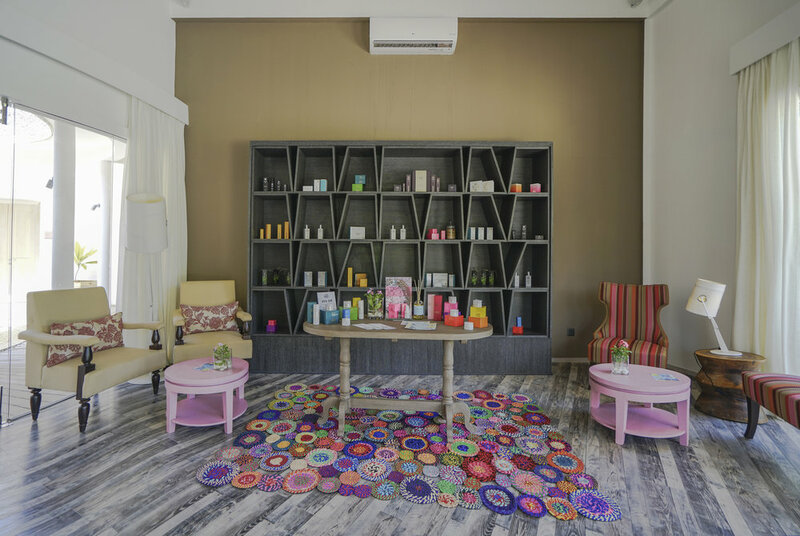 Guests can enjoy a lovely massage after a long day of activities, or do a facial treatment after sunbathing. 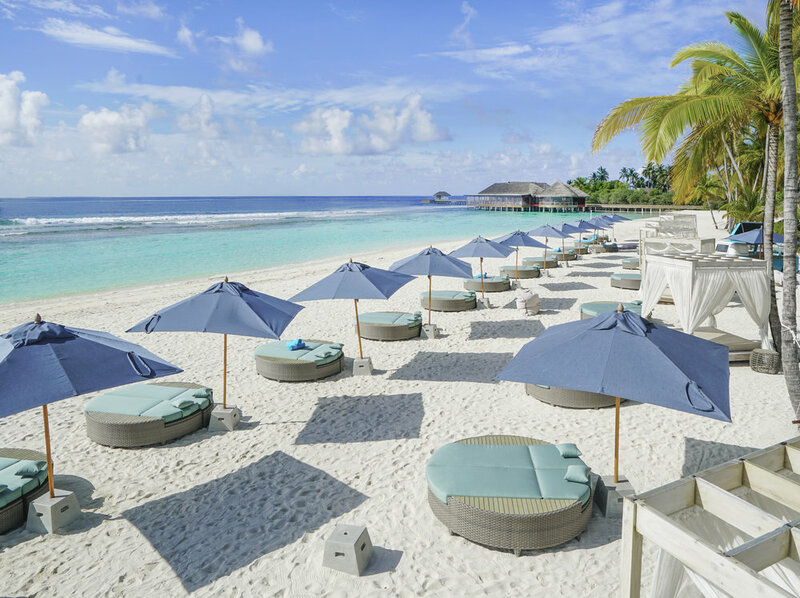 Finolhu, just like its sister property Amilla Fushi, also have all inclusive packages where guests can purchase before or upon arrival. Guests can choose either get either half board or full board, and also an unlimited beverage package. Fish and Crab Shack, definitely my favorite location to have lunch on this island, as seen on the first two photos below - this restaurant is only opened daily for lunch (if weather permits). It is located in the middle of the long sand strip that is unique to this island. There are regular boat ride that takes guests back and forth from the main area of the island to the restaurant, or those of you who are up for a good walk before/after a meal can also walk here (takes about 10 minutes from the main pool). The Fish and Crab Shack have a good selection of seafood and snacks to choose from, or one can simple enjoy a drink and hang out in the water. There are plenty of beach chairs along the sand strip so guests can just enjoy an afternoon away from their guest room. Baa Baa Beach Club (or the 1 Oak Beach Club), the main dining that serves continental breakfast and dinner in buffet style. Every night, there are different buffet theme for guests to choose from. In addition, guests can enjoy a nightly entertainment if you choose a poolside or a table near the beach. 1 Oak Beach Club also host 6 retro pool parties a year, inviting DJs and performers worldwide for a party. Milk Bar, an old school tuck shop that is located by the gym, guests can grab a snack bar or a nice smoothies or an acai bowl on their way. 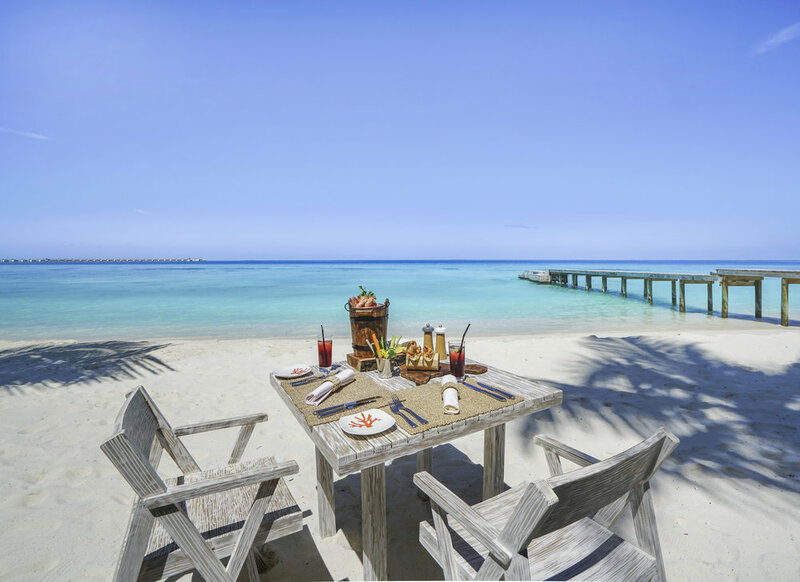 BaaHaa Grill, brings Maghreb flavors to the Maldives, using the spice blends of pre-Moorish North Africa. Kanusan, located on the tip of the island, beautiful dining venue by the ocean, serves classic Asian dishes. It is probably my favorite restaurant on the island besides the Fish and Crab Shack.